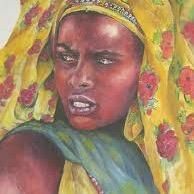 Growing up in Somalia, a country where stories are handed down through generations, one of the first tales that children are told is about an ancient queen who fought to give women power by castrating men. Retropod is a show for history lovers, featuring stories about the past, rediscovered. Host Mike Rosenwald introduces you to history’s most colorful characters – forgotten heroes, overlooked villains, dreamers, explorers, world changers. As no known portraits of Queen Arawelo exist, the artwork for this episode was inspired by contemporary imagery and descriptions.